Airbus CEO Tom Enders, right, speaks to journalists while Airbus CFO Harald Wilhelm looks on, during the Airbus Group press conference on the 2017 annual results in Toulouse, France, Feb. 15, 2018. Shares in European plane maker Airbus flew higher on Thursday after the company reported improved earnings and was more upbeat about the future following problems to several of its key aircraft programs. The company said that it surged to a net profit of 1 billion euros ($1.25 billion) in the fourth quarter, from a loss of 816 million euros a year earlier, while revenue was stable around 23.8 billion euros. Airbus delivered a record 718 aircraft last year and expects that figure to rise further in 2018, to 800. CEO Tom Enders credited "very good operational performance, especially in the last quarter." Shares in the company jumped about 10 percent on Thursday in Paris. Investors seem optimistic that the company is putting behind it the worst of its troubles with three airplane production programs. FILE- A Qatar Airways Airbus A350 approaches the gate at the airport in Frankfurt, Germany. Airbus, which is based in Toulouse, France, said it took another charge of 1.3 billion euros on its A400 military plane, which has had cost overruns for years. It said, however, that it had reached a deal with the governments that are buying the planes on a new delivery schedule that should rein in any new charges on the program. The company also acknowledged that it had had more struggles with engines supplied by Pratt & Whitney for the A320neo, a narrow-body plane that's popular with regional airlines. The supplier had had problems with the engines last year, which it fixed, but reported a new issue more recently that could affect 2018 deliveries, Airbus said. 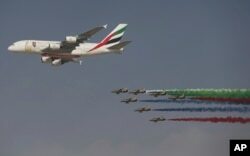 An Emirates Airline A-380 leads the "Al Fursan", or the Knights, a UAE Air Force aerobatic display team, during the opening day of the Dubai Air Show, United Arab Emirates, Nov. 12, 2017. Another of Airbus' troubled plane models, the A380 superjumbo jet, now has a more stable outlook after the company reached a deal with Emirates airline that will cover the cost of production for years. The various problems with these production programs risked overshadowing what was otherwise a strong year for Airbus in terms of earnings, as global demand for commercial aircraft grows. Airbus raised its dividend by 11 percent and said it expects one of its key earnings metrics — earnings before interest and tax — to rise 20 percent in 2018.